We’ve extended our Valentine’s day sale to the end of March and renamed it March Madness. We’ve been working with dollmaker Maureen Swart in South Africa. The snail mail between the USA and South Africa is very unreliable, so we have set up downloads for all of our video workshops. Both Mimi’s Mannequins and Mimi’s Modular Mermaids are now available in downloads for all those places where snail mail is unreliable, and we’ve added them to the March Madness Sale. Mermaids is 20% off and Mannequins is 25% off. If you’ve missed the sale, go to Mimidolls.Com now and click on the sale box on the home page. You have another chance for The Essential Mimi Collection, all of our Video Workshops, all of our Storyboard Workshops, and our most popular patterns. And if you are in a part of the world where snail mail is unreliable, or if you just want to save the cost of shipping ($3.99 in the USA, $10 in Canada, $15 elsewhere) you have an opportunity to download and save both the shipping charge and get the discounts from 16% to 25% on the workshops. Mimi’s Mannequins and Pattern Draping (Techniques for Dollmaking) is almost finished and it is spectacular. It has almost 6 hours of classroom video full of techniques for dollmaking. We began this project almost 5 years ago, and we got interrupted by cancer. Now we’re back on track for Christmas of 2015. 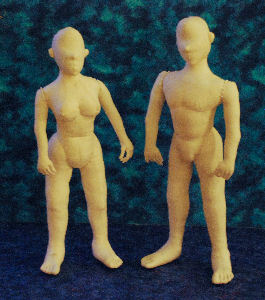 Mimi’s Mannequins presents quarter-scale male and female mannequins as separate patterns with a single set of instructions for both. 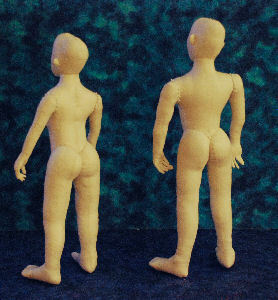 The dollmaking workshop is all about techniques and the similarity of the human form. Mimi’s Pattern Draping shows you how to create patterns for clothing that will fit your own dolls. It uses the mannequins as tailor’s dummies for draping the clothing patterns. We have condensed the 4-day dollmaking workshop and the 2-day pattern draping workshop into almost 6 hours of video. Unlike previous workshop DVD sets, we will not be manufacturing this one by ourselves. We are forced to go to a pre-ordering setup to have the money to pay for the manufacturing. A Shopping List e-book that you can copy to your phone or tablet (or print out) to take to the crafts store with you. The pattern sheets can be printed on your own printer, or you can take them to an office supply store or copy center. After watching the videos, you can use the included step-by-step, photo-by-photo storyboards on your phone, tablet, or computer to make the dolls and clothing. You can refer back to the video anytime you need it. In addition to the videos, the go-at-your-own-pace, step-by-step, picture-by-picture storyboards make Mimi’s Mannequins & Pattern Draping suitable for all levels of doll makers from beginner to advanced. You need some hand-sewing and machine-sewing experience, and it’s not really for first time (novice) dollmakers. It is particularly good for those who have trouble fitting clothes on dolls. We’re opening a Kickstarter campaign on Thursday, Oct. 15th for pre-orders. We’re launching it on Kickstarter so we can raise enough money to publish the 4-DVD set. We’ve got some really great discounts, and some nice perks and souvenirs like the 2015 Kickstarter Hall of Fame at Mimidolls.Com, a chance to vote on features of what we do next, a signed & numbered limited edition, having your name listed in the ending credits, all the way up to a visit to Mimi’s studio. Here’s the opening video that tells you about Mannequins. At the Kickstarter pre-order campaign. You can also see the full video (24 minutes) of Lesson 5: Making Arm & Hands by visiting the kickstarter campaign. Sorry for taking so long to let everybody know what’s happening with Mimi – I have been sick and away from the computer for a while. Mimi’s neck is fine. She is off the soft collar except when she has overdone working, or come back from physical therapy. She has about one more month of physical therapy to go (twice a week to get more range of movement). She was allowed to go back to chemotherapy about four weeks ago, but I waited for the scan results before sending out an update, and then waited while we figured out what the scan results meant. She still has the spots on the dome of her liver. We started the Captosar again, every other week, which is less aggressive treatment than before. It’s not clear whether the doctor doesn’t think more is needed, or whether he’s just treating it like a chronic disease, which it is. The Captosar causes much more nausea than the previous treatment (oxyplatin), but doesn’t cause side effects that cause peripheral neuropathy. She has a new treatment for the chemo induced peripheral neuropathy (CINP) that is much better. So, on the two week schedule, she is sick for about one week and okay for about one week and then we start over. No end in sight yet. Next scan in about 3 months. Mannequins and Pattern Draping is almost done. We will starting taking pre-orders about the middle of September for before Christmas delivery. We are going to use a crowd funding site and have special deals and premiums to get things moving. This is necessary because it’s one hell of a good DVD class, and we can’t manufacture enough sets by ourselves, so we have to have enough money from pre-orders to pay a manufacturing company. We used to do this ourselves, but we aren’t up to it this time. We’ll send out notices when it’s ready. Mimi only gets to her email about once every 2 weeks. Don’t be alarmed if you send her email and don’t hear back in a reasonable amount of time. I have been sick for about a week. The doctor thinks it’s flu. I think it’s stress. I’m getting back to work now. How can it be a Mimi Doll without a needle-modeled face? See for yourself! I painted the face of the male mannequin (manikin) and we made a FREE VIDEO that you can watch on here and at (http://Mimidolls.Com). Mimi’s Mannequins are a pair of adult dolls, a 15½” female and a 17″ male. They are very easy dolls to make. The shape is built into the patterns and the techniques are built into the instructions. 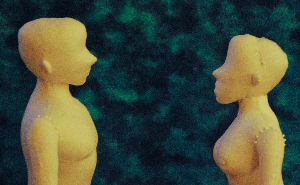 The 2-disc Dollmaking Workshop Classroom on a DVD will be available in mid-November, 2011. The second disc is a class on how to drape the bodies and feet to make basic contemporary patterns for bodices, shirts, skirts and pants, and shoes as well as wigs. Once you understand how to drape you can drape anything, even a horse. Be sure to keep track of the status here on the Diary of a Mad Dollmaker blog. There’s a place over at the end of the right column where you can get an email subscription. I have been working on samples of new dolls for my next DVD. The patterns are finally done after 15 attempts. They are a pair of adult dolls, a 15½” female and a 17″ male. They are very easy dolls to make. They just took a long time to design. Easy is not the same as simple. I do complicated very well. It only took 30 years to figure out how to simplify a doll pattern from 36 pattern pieces down to 8 or 10 and still have the same form – in muslin. Anyway, a simple doll is a cookie cutter doll – a doll with 1 pattern piece. Some of my pin dolls have 2 pattern pieces. A simple doll is usually easy. The Mannequins are EASY-TO-MAKE complex dolls. The shape is built into the pattern and the technique is built into the instructions. When I make a doll in micro suede or other fabrics with more stretch, I feel as if I am cheating because I can take a one-dimensional pattern and make it look three-dimensional with the way I stuff it – it is so much easier for me. But I also like the look and feel of a really good cotton muslin. I have had letters, (way back when), from folks who saw my dolls in a magazine and asked where I get my molds. The interesting thing is that except for the torso front, the directions for the male and the female are exactly the same! The female has two upper front torso pieces and one lower front torso piece to get the breasts. The male has one upper front torso piece and two lower front torso pieces to get the abs. The rest of the doll construction is exactly the same – the shapes of the pattern pieces are similar but different. The pattern pieces even have the same numbers: F1, M1, F2, M2, etc. Jim says I have to get the dolls all on one disc. They are actually mannequins but I gave them legs and heads because I know whoever purchases the discs will want to make dolls from these patterns. The arms are not sewn on because the body must be draped before the arms are stitched in place. I put the bodice on the doll, then sleeve the arm, roll back the sleeve and stitch the arm in place then stitch the sleeve to the bodice, the second disc will teach you how to drape patterns and create clothing to fit any doll. The second disc is a class on how to drape the bodies and feet to make basic contemporary patterns for bodices, shirts, skirts and pants, and shoes as well as wigs. I hope there is room on the disc to show how to create a doll’s tailored jacket. I am tired of seeing “male” dolls wearing jackets that do not fit properly and look as if it has been slept in for months. Once you understand how to drape you can drape anything, even a horse. The reason we have to keep it to one disc for the dolls and one disc for the draping and clothing is to keep the price down so it’s more affordable. I would like to do a series of DVD classes on how to create patterns and sew period costumes for these mannequins. If the costume requires a certain style of shoe I will include a new leg for each doll that will have the foot shaped as if it were already wearing the shoe for that outfit. Then it can easily be draped to cover the “shoe” with cloth or leather. I have had a couple of requests for early 20th century patterns. I enjoy both Italian and French Renaissance, and English Elizabethan court clothing. Wigs will have to be included. Each “class” will be limited to two discs to keep them affordable. If there is a particular period you prefer let me know and I will add it to the file I keep so I can do the ones you want most next.